Visitors to Hong Kong must hold a valid passport. Passports should be valid for at least six months after your planned departure date from Hong Kong. Nationals of most countries are not required to obtain visas for periods varying from seven days to 180 days, depending on nationality. Check with any Chinese embassy or consulate for the latest status. For more information about Visa requirements please refer to Visit Visa/ Entry Permit Requirements by clicking here. Now, frequent business travel to Hong Kong is easier than ever with the Hong Kong Special Administrative Region (HKSAR) Travel Pass. For more details on the Travel Pass, please visit the Immigration Department's website. If you would like to obtain an application form, click here. Visas for mainland China can be obtained in Hong Kong. They require one photo and usually take three working days to process. Visas can be obtained through the Visa Office of People's Republic of China, Office of the Commissioner of the Ministry of Foreign Affairs of the People's Republic of China in Hong Kong, China Travel Service (HK) Ltd, or China International Travel Service HK Ltd.
All visitors entering Hong Kong must go through customs clearance. View a list of dutiable commodities. Departing visitors should note that enhanced security measures are now in effect at Hong Kong International Airport. Visitors are reminded not to carry any sharp objects with a point or blade such as knives, cutters, scissors, razor blades, or household cutlery in carry-on luggage. Instead, visitors should place such items in check-in baggage. Some personal protection devices like the spray mace, while legal in some countries, are prohibited in Hong Kong. To avoid any unnecessary delays, please follow the guidelines from HKIA. Please refer to the Customs & Excise Department web pages for more information about prohibited articles /goods. Most public transport requires exact change and that's why we recommend that you get an Octopus card. This electronic stored-value card is just like money and is accepted on most public transport including buses, minibuses, trains, ferries, the Peak Tram, and some taxis. It's even accepted at convenience stores and fast food restaurants. To pay a fare, simply place the Octopus card on the reader located next to the fare box and the fare gets deducted electronically. A new Octopus card includes a refundable HK$50 deposit. Any leftover money is also refunded when you return the card. Ask for it at the Airport Express Customer Service Counters on Level 5 of the Hong Kong International Airport, and the cards are also available at most public transport customer service centres. How to Reach HKCEC ? Getting on the Airport Express Train from Airport and alight at Hong Kong Station (fare: HK$100), and travel with the free of charge shuttle bus route no. H1 to HKCEC in Hong Kong Station. For more information, please visit http://www.mtr.com.hk or http://www.hongkongairport.com/eng/aguide/airportex.html. Click here to view the bus-stop near the HKCEC. For more information, please visit http://www.citybus.com.hk/eng/ or http://www.hongkongairport.com/eng/aguide/bus.html. By Taxi, you can simply show the driver the map of conference venue. In Hong Kong, there are 3 types of taxis, but only the Urban Taxis (red) can reach the conference venue. Including the bridge toll HK$30, the fare from Airport to Hong Kong Convention and Exhibition Centre is around * HK $340 , baggage will be charged exclusively (not more than HK $5 each piece). Participants can ask for receipts from the taxi driver before the payment. In addition, fare bargain is not allowed in Hong Kong. Please click http://www.hongkongairport.com/eng/aguide/taxis.html or http://www.discoverhongkong.com/eng/mustknow/information/mk_info_gett3.jhtml for more information. If delegates decide to reach here by taxi, they can download one of these maps (Map 1, Map 2) and show the location to the taxi driver. * Subject to traffic condition, and Octopus is only applicable for some taxis. 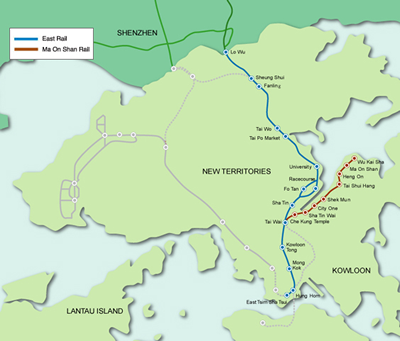 KCR provides intercity passenger services between Hong Kong and the Mainland with three through train routes, namely the Beijing line, the Shanghai line and the Guangdong line. The Guangdong-Kowloon Through Train calls at Dongguan (Changping), Guangzhou East, Foshan and Zhaoqing. There are currently twelve pairs of through trains running between Hung Hom and Guangzhou East daily, in which 8 Northbound trains and 9 Southbound trains call at Dongguan (Changping), with a total journey time of about 1 hour and 40 minutes. One pair calls at Foshan and terminates at Zhaoqing with a total journey time of about 4 hours. The Beijing-Kowloon Through Train and the Shanghai-Kowloon Through Train operate on alternate days with a total journey time of about 24 & 26 hours respectively. After getting off the train from Hung Hom station, delegates can travel Cross Harbour Tunnel Bus route nos. 101, 103, 104, 111, 182 at Cross Harbour Tunnel Toll Plaza. The fare is HK$8.9. Click here to view the map for getting off the bus near HKCEC. Or you can just reach the Convention and Exhibition Centre by taxi. The detailed information about taxi, please visit From Airport to HKCEC by Taxi. For delegates immigrate from Lo Wu, they can travel by train (namely KCR East Rail in Hong Kong), interchange from KCR to MTR (metro) train in East Tsim Sha Tsui Station (namely Tsim Sha Tsui Station only in MTR), interchanged in Admirlty Station and destined at Wan Chai Station. Or delegates can getting off from East Tsim Sha Tsui Station, travel by ferry at Star Ferry Pier to Wan Chai (Convention Centre) Line to Wan Chai Ferry Pier. Also, delegates also are welcome to travel from East Tsim Sha Tsui to Wan Chai by taxi (at Hankow Road taxi station). However, if delegates would like to travel by bus, it is better for getting off the trains at Hung Hom Station rather than East Tsim Sha Tsui Station. Click here to view the location map of Tsim Sha Tsui. Delegates can travel by MTR, as same as delegates who travel by trains, they can getting on the MTR (metro) trains at Tsim Sha Tsui Station to Wan Chai Station, interchanged at Admirlty Station, or travel by taxi at Hankow Road taxi station, or travel by ferry at Star Ferry Pier. Details information can be found in above.